da Vinci Robotic Surgery vs.
*Procedure switched from minimally invasive to open surgery due to complexities encountered during the operation. da Vinci Surgery is allowing gynecologists to perform far more minimally invasive procedures with equal or better outcomes compared to traditional open and laparoscopic surgery. The da Vinci System is a state-of-the-art surgical platform with 3D, high-definition vision and miniaturized, wristed surgical instruments designed to help doctors take surgery beyond the limits of the human hand. By helping doctors to overcome the challenges of traditional open and laparoscopic surgery, da Vinci is changing the experience of surgery for women around the world. If you have been putting off treatment for a gynecologic condition, it’s time to ask your doctor about da Vinci Surgery. Ko EM, Muto MG, Berkowitz RS, Feltmate CM.Robotic versus open radical hysterectomy: a comparative study at a single institution. Gynecol Oncol. 2008 Dec;111(3):425-30. Epub 2008 Oct 16. Piquion-Joseph JM, Navar A, Ghazaryan A, Papanna R, Klimek W, Laroia R. Robot-assisted gynecological surgery in a community setting. Journal of Robotic Surgery, 2009:1-4. DeNardis SA, Holloway RW, Bigsby GE, Pikaart DP, Ahmad S, and Finkler NJ. Robotically assisted laparoscopic hysterectomy versus total abdominal hysterectomy and lymphadenectomy for endometrial cancer. Gynecologic Oncology 2008;111:412-417. Payne, T. N. and F. R. Dauterive. A comparison of total laparoscopic hysterectomy to robotically assisted hysterectomy: surgical outcomes in a community practice. J Minim Invasive Gynecol, 2008;15(3): 286-291. Boggess JF, Gehrig PA, Cantrell L, Shafer A, Ridgway M, Skinner EN, Fowler WC. A comparative study of 3 surgical methods for hysterectomy with staging for endometrial cancer: robotic assistance, laparoscopy, laparotomy. Am J Obstet Gynecol. 2008 Oct;199(4):360.e1-9. Bell MC, Torgerson J, Seshadri-Kreaden U, Suttle AW, Hunt S. Comparison of outcomes and cost for endometrial cancer staging via traditional laparotomy, standard laparoscopy and robotic techniques. Gynecol Oncol. 2008 Dec;111(3):407-11. Epub 2008 Oct 1. As with any surgery, these benefits cannot be guaranteed since surgery is specific to each patient, condition and procedure. It is important to talk to your doctor about all treatment options, including the risks and benefits. This information can help you to make the best decision for your situation. While clinical studies support the effectiveness of the da Vinci Surgical System when used in minimally invasive surgery, individual results may vary. There are no guarantees of outcome. All surgeries involve the risk of major complications. Before you decide on surgery, discuss treatment options with your doctor. Understanding the risks of each treatment can help you make the best decision for your individual situation. Surgery with the da Vinci Surgical System may not be appropriate for every individual; it may not be applicable to your condition. Always ask your doctor about all treatment options, as well as their risks and benefits. Only your doctor can determine whether da Vinci Surgery is appropriate for your situation. The clinical information and opinions, including any inaccuracies expressed in this material by patients or doctors about da Vinci Surgery, are not necessarily those of Suburban Gynecology. and should not be considered as substitute for medical advice provided by your doctor. 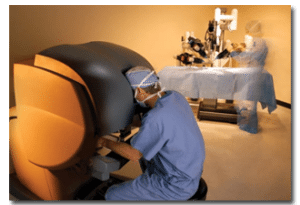 Using the da Vinci Robotic Surgery system, surgeons can operate with GREATER PRECISION & control with a high definition 3D VISION & a magnified view. To learn more about da Vinci Robotic Surgery please take a moment to view our educational library.